For years now, there’s been a shortage of coins in Argentina and especially in Buenos Aires, where they’ve been necessary to purchase bus, subway and train tickets. 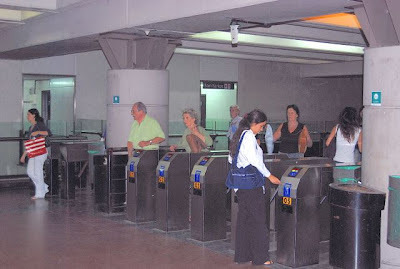 For that reason, the Porteños of Greater Buenos Aires have hoarded coins, exacerbating the problem, despite the creation of a new integrated fare system called the Sistema Único de Boleto Electrónico (SUBE, Single Electronic Ticket System) in 2009. It’s been slow to take effect – a similar Monedero card for the Subte has seen limited acceptance – but after years of dithering, Argentina’s federal government has finally forced the issue. With fares going up on all three systems, the Secretaría de Transporte (Transport Secretariat) recently decreed that, to continue to take advantage of current transport subsidies, riders must obtain or apply for a SUBE card by Friday, February 10. Current Monedero cards will not be eligible for the subsidized rates (the new rates are not yet completely clear). As my friend Nicolás Kugler has written me, “We have a problem for every solution.” The SUBE card has meant blocks-long lines at the various centers where patrons can obtain them: “Long queues can be seen nowadays at every post office, kiosk, street stand, or parked bus where the SUBE sign is displayed” (The Secretariat even had to open a center in Mar del Plata, where so many Porteños spend their summer vacations). Given the time-consuming difficulty of getting a card, which is free of charge, the agency opened a website where riders can request one electronically and receive it in the mail (presuming the post office operates more efficiently than the Transport Secretariat does). Riders must submit their name, address and DNI (national identity card) or other form of ID in order to obtain it. So, it seems, non-resident foreigners are not eligible for the SUBE card which, on the face of it, appears tied to each individual’s identity card. That, however, raises the (admittedly unlikely) specter of station attendants and bus drivers checking each rider’s ID to assure that nobody was using another’s SUBE card. In practice, though I might not be able to get my own card, I expect to be able to use my wife’s, as I’m usually in town more often than she is. In fact, even when we’re traveling together, there’s no obstacle in using the same Subte ticket by just passing it back across the turnstile (no ticket is necessary to exit the system). SUBE is an interesting acronym because, in standard Spanish, the word sube (infinitive subir) is a clever pun in that it means “climb aboard” in the second person familiar. It’s not quite correct in the Argentine context, though, because of slightly different verb forms: Argentines would say subí (in the second person familiar), while suba would be the second person formal version in both Argentine and standard Spanish. Critics of the plan, though, have a different interpretation of the acronym. They note that, when users top up their cards, they are in effect providing the government an interest-free loan – critics might say “slush fund” - that could total up to 500 million pesos (about US$125 million). According to them, it should stand for “Somos Unos Boludos Enormes,” roughly translatable as “We’re a bunch of enormous dorks” for putting up with a bureaucratic maneuver that they see as a money grab. I’m not quite that critical. While I think SUBE’s implementation is clumsily bureaucratic, something was necessary to integrate the system and, in the long run, it should be a positive. 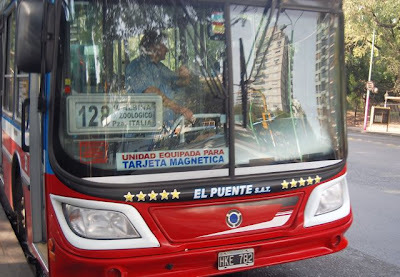 The issue of simply obtaining change aside, it will also mean greater safety because bus drivers, who have been vulnerable to robberies in some of Buenos Aires’s more dubious suburbs, will not have to carry any cash. 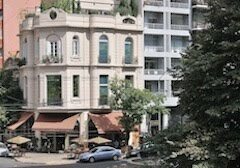 An etymological digression: the slang word boludo has off-color origins but, in today’s Argentina, it’s more innocuous than it once was – you can call a friend boludo or bolú, and I’ve even seen it in humorous TV advertisements. It is inappropriate in formal Spanish, though, and if you address a stranger as boludo, "Them could be fightin' words." Win a Prize from Southern Cone Travel! I am still waiting on a winner or two from the contest from Saturday on the entry immediately below this one. Please have a look and enter, or I'll have to withdraw the remaining prizes.